This blog is being maintained by Kathy Nganga and Sarah Cornelius to document the work and insights of the 2018 summer interns. Monday, was our first day of work! We walked to work together on Monday morning and the wonderful folks at Teaching for Change welcomed us with a sign on the door that greeted us by name. Seeing this, we felt valued and loved :). Our first project took us to the Teaching for Change Resource Center, which houses a collection of multicultural and social justice books for children, young adults, and educators. The books are organized thematically into groups like “Civil Rights Movement,” “Immigration,” “Asians and Asian Americans”, “Skin Color and Racial Identity,” etc. As we started sorting through the uncategorized books, our initial task of reshelving a few boxes of children’s books quickly grew into the two-day project of reorganizing the whole room. While some stories fit neatly into categories that already existed, others challenged us to create new categories or relabel older ones to be more inclusive and accurate. For example, a book set in Egypt brought up the controversy about whether Egyptians are considered Arab or African, and led us to relabel the Middle East section as the Middle East and North Africa. We also relabeled the category “American Indians” as “Indigenous Americans” to recenter indigeneity and its implied rights to land over the colonial (mis)identifier and expanded the LGBTQ section to LGBTQIA to include those who identify as intersex or asexual. Moving beyond the exceptional in resources for children and in education is a cause that Teaching for Change has worked on for years. To find out more, check out the resource Beyond Heroes and Holidays. We also decided to organize the categories thematically instead of alphabetically. Now, instead of finding Central America, Class, and Civil Rights next to one another, Central America shares a shelf with Latinx and Latin America, Class shares a shelf with Labor, and Civil Rights a shelf with Slavery. On Tuesday, we had the privilege of meeting Student Nonviolent Coordinating Committee (SNCC veteran) Tim Jenkins. To learn more about his work, read Jenkin’s 1968 open letter where he warns of the far right. His words still ring eerily true today. After we met with Mr. Jenkins, we headed to the conference room to meet the rest of the staff at Teaching for Change and pilot a new lesson on migration from Central America with them. On Wednesday, we had the privilege of spending the whole day at Capital City Public Charter School. Many of the teachers there are active in the Teaching for Change network called the D.C. Area Educators for Social Justice. We were there to experience the high school’s Celebration of Learning in the morning, and, in the afternoon, served as panelists for presentations that 10th graders give to demonstrate their readiness to move on to 11th grade. We were so amazed by this school, its staff, and especially the students! The Celebration of Learning started in the theater, where the band performed a number of pieces, included “Like a Mighty Stream”, a piece composed in remembrance of Dr. Martin Luther King Jr. Belicia Reaves, the high school principal at Capital City, joined the band on stage as the narrator. Reaves guided the audience through the three stages of the piece: the dream, the struggle, and hope. A dance performance followed the band’s concert. A student conceived the idea for the dance, and with the help of the school’s fitness and dance instructor, Tyra Jackson, she along with some peers brought the piece to life. The dance was a nuanced expression of mental health challenges and loss. Later in the afternoon, Kathy sat in on Jackson’s debrief of her students on the performance and the content of the performance. Jackson related to her students, met them where they were, and encouraged each student to speak and debrief with the group. After the morning’s performances, we attended sessions organized around each subject area and grade level. In these presentations, students taught their peers something they had learned over the course of the year. One highlight was the 9th graders in Saif Shah’s English class who, having recently read Just Mercy by Bryan Stevenson, were asked to write plays in small groups on the criminal justice system and areas for reform. The stories they created cut right to the heart of some of the injustices present in our justice system. It was amazing to listen to what they produced and share the experience with the 11th grade English class who had come to watch and support. Another highlight was Amrita Wassan’s 11th grade U.S. history group who set up stations with historical clues for the 9th graders to figure out why there was violence against Chinese Americans in the late 1800s. Through their lesson, they taught their peers about racial discrimination against Asian Americans in the United States. In every session we visited, we were struck by the students’ ownership over the learning, their pride in their work, and the infusion of critical thought and social justice in all aspects of their, their art, and the materials they used. In the afternoon, we were invited to sit in on 10th-grade portfolio presentations. In these panels, students were considered holistically. The presentation required students to reflect on their social, emotional, and academic strengths and areas where they can grow. To do this, students used Capital City’s community values of compassion, contribution, integrity, courage, and self-discipline to evaluate how they did projects and engaged with their peers. Each presentation was followed by a Q&A section, which was amazing to take part in. The teachers on the panel engaged with the student not just on the content but in relation to things happening in the student’s life, advice for moving forward, and resources that the student should use at the school, exemplifying the ethics of care. We spent Thursday, writing our critique of Scholastic’s children’s book about Donald Trump. We got feedback from Teaching for Change staff, made revisions, and worked on it again on Friday. It has not been posted and is drawing a LOT of attention. Please consider writing to Scholastic. On Friday, we went to a panel called “The Migration Cycle: The US role in Latin American migration” hosted by The Institute of Current World Affairs. One theme from the panel was the importance of humanizing migration at a time in which, as panelist Daniela Burgi-Palomino of the Latin American Working Group stated, “the Trump administration has criminalized and dehumanized all migrants. Manuel Orozco, a panelist from Inter-American Dialogue claimed that the main issue with migration is that what was once treated as a civil issue has been completely criminalized. Kristian Hernandez, a journalist, emphasized the importance of including emotion in stories about migrants to connect with readers. The panel also discussed the role of nationalism and nativism in driving anti-immigrant sentiment. Orozco lamented that Trump’s approach to migration represents the undoing of the fundamental American values of compassion and fairness that define our political culture. We were lucky to attend the panel with two staff members from Teaching for Change, Faye Colon and Nqobile Mthethwa. Faye asked the panelists for recommendations on resources that teach students about Central America and migration in a humanizing way, and the panel noted that this was truly “uncharted territory.” They recommended that educators look to organizations that produce objective analyses or partner with organizations and think tanks hoping to have the knowledge they produce to reach a wider audience. Teaching for Change offers the only website with resources for teaching about Central America. When we worked on reshelving the books, we came across Tea Cakes for Tosh by Kelly Starling Lyons. The picture book artfully discusses issues of aging, memory, and slavery and makes these issues accessible to young children. At the end of the book the author includes a recipe for tea cakes, and inspired by the narrative, we decided to make some tea cakes over the weekend. Hi all! My name is Abby, and I am interning with the Zinn Education Project this summer. So excited to be here! Last week, I continued to work on ZEP’s new website (coming soon!) by uploading teacher testimonials to the new site. It was so interesting reading about teachers’ experiences using these materials in the classroom – reading them showed me yet again the immense value of ZEP. In addition to working on the website, I also began to create social media posts based on ZEP’s new resources to teach for environmental justice. It was incredible to read the lesson “From Mountaintop Removal to Divestment” in particular, as I am a student at Swarthmore College and was one of the lead organizers of our fossil fuel divestment campaign. It is so exciting to see the connections between our work on campus and the work done by ZEP and so many others, and to see how this work is continuing to reach and inspire people far beyond the limits of our small campus. Last week we published a critical review on Social Justice Books of Scholastic’s biography of Donald Trump written for first and second graders. The critique was shared by hundreds and sparked outrage among educators, parents, and librarians across the country who wrote in, tweeted about, and joined the call for Scholastic to recall the biography and issue an accurate, age-appropriate text. Within a week, 800 letters were sent to Scholastic. Sarah sifted through these letters and published (with permission) many of them, along with tweets and articles, to the #StepUpScholastic Tumblr. Take a moment to read some of them. If you have not written a letter and would like to ask Scholastic to step up, please consider writing to Scholastic. Kathy worked with the TFC staff to write a review of the Scholastic biography on Trump written for 3rd-5th graders entitled A True Book: President Donald Trump. Unfortunately, the book for 3-5th graders is still far from an accurate portrayal of Donald Trump’s life. This public outcry caught the attention of several progressive media outlets, who covered the #StepUpScholastic campaign. Read the coverage from ThinkProgress and Yes! Magazine. It also caught the attention of right-wing media, like TheBlaze, The College Fix, Breitbart, and even made Trump’s favorite program, Fox & Friends. With the mounting media attention, Scholastic issued a public statement from their CEO which failed to address a single point of our critique. 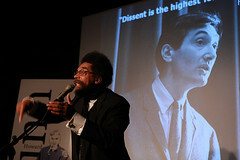 Instead, it defended the omissions in the biography by making egregious claims like “Discussing controversial aspects of any public figure’s life isn’t appropriate for our youngest readers.” Read Social Justice Book’s full rebuttal to the statement, and another insightful response to the statement from Scholastic author, Daniel José Older. Monday, June 11th: Transforming Public School Teaching in DC: A Model for the Nation? On Monday we attended a presentation and panel discussion on a report recently published by FutureEd on District of Columbia Public Schools’ (DCPS) human capital transformations over the past decade. Programs like IMPACT (comprehensive teacher evaluations), LIFT (career/compensation ladder driven by experience and said performance) and LEAP (a professional development initiative) have been implemented in DC in hopes of identifying, developing, and retaining highly effective teachers for all students. According to FutureEd, these reforms “have evolved from a focus on teacher employment to a focus on teacher improvement.” However, as discussion opened up to the panel, it became clear that stakeholders were not uniformly in favor of these reforms. The panel included Eric Bethel, principal of Turner Elementary School, Elizabeth Davis, president of the Washington Teachers Union, Brian Pick, Chief of Teaching and Learning at DCPS and Ross Wiener, vice president of the Aspen Institute. Elizabeth Davis offered several compelling challenges to the reforms. She spoke of teachers’ frustration over a lack of respect and inability to participate in decision making around the reforms, and reminded policymakers that if teachers don’t like or trust an evaluation tool, it’s no good. Some of the specific concerns she raised with IMPACT (the evaluation tool) included, among other things, the burden it imposed on new teachers, who might be labeled “minimally effective” even if they are simply developing or lacking support, as well as the fact that many teachers who had consistently been rated “highly effective” tumbled back down to “developing” if they moved to more challenging and underserved schools. Although advocates for the reforms in the room continuously pointed to the fact that retention was significantly stronger among teachers rated “highly effective” (94%) than among those rated “minimally effective” (49%), Davis’s comments made it clear that these reforms might be pushing more high quality teachers out of the District than policymakers let on. Sarah began Wednesday by visiting Bruce Monroe Elementary School to attend a Tellin’ Stories Principal Chit-Chat, where parents and the PTA meet with the principal to collaborate and voice their ideas and opinions. Because the school serves a bilingual population (Spanish and English), the meetings are run with a conscious effort to be inclusive and accessible to all parents, regardless of their language: whenever something was shared in English, someone would interpret it into Spanish, and vice versa. Watching parents, staff, and administration work together, celebrate together, support and trust one another made it clear that Bruce Monroe is clearly thriving as a school and a community. On Thursday, Kathy had the opportunity to attend a symposium on the Poor People’s Campaign at the Library of Congress. The library organized two panels to discuss the poor people’s campaign. Some were direct participants of the 1968 Resurrection City and Poor People’s Campaign, others worked to educate the public about the PPC, and some organized and mobilized with the modern Poor People’s Campaign. The symposium began with staggering statistics of poverty in America today. 40.6 Million Americans live in poverty in the US, 43% of children live at or below the poverty line, and 53.8 million us workers earn below a living wage. The “triple evils” of poverty, militarism, and racism that the 1968 PPC worked on are still present and pressing today. Historian and professor Gordon Mantler of George Washington University began the morning by reminding the audience of the interracial and coalition dynamic of the 1968 Poor People’s Campaign. Dr. Lenneal J. Henderson and Marc Steiner took us back in time and described their first-hand experience working on the poor people’s campaign and what came after the government dismantled the camp. Understanding the history and experiences of those who worked on the Poor People’s Campaign and lived in Resurrection City provided the perfect foundation for session one’s final two panelists. Margaret Gilmore and Nick Petr discussed their work with DC public library to commemorate the 1968 PPC through curating Poor People’s Campaign resources, events, and creating the “people’s university.” While the idea of a “poor people’s university” harkens back to the 1968 PPC, audience members noted that in many ways libraries today function as institutions of education, labor readiness, and provide other social services. In the afternoon, panelists used multimedia mediums show what occurred in the 1960s and what’s happening today with the modern Poor People’s Campaign. The imagery and music were powerful. Marya Annette McQuirter curator of dc1968 project challenged the visual tropes of the dominant focus on black and white imagery from DC in 1968. Rather, her work seeks to incorporate colorful pictures and other media produced at that time. One image she shared with the group was one in which the words “no justice here” are scrawled across the Department of Justice. Charon Hribar and Yara Allen shared some of the music and art used in today’s poor people campaign. Allen and Hribar discussed how today’s activists have carried forward old protest musical traditions by infusing hip-hop into protest songs of the past. This clip of “Everybody’s Got a Right to Live” exemplifies this bridging of traditions. On Friday, Kathy accompanied Nqobile to “The Future is Digital: The Future is Publishing without Walls” a University of Illinois digital incubation initiative funded by the Mellon foundation. Nqobile and Kathy attended a workshop held at the DC Public Library. At the session, we learned about different platforms that can help scholars publish their work digitally. These platforms included: Open Journal System, Omeka, Open Monograph Press, Pressbooks, and Scalar. The organizers also showed example projects designed with each platform. The #JayZMixTape, created by Dr. Kenton Rambsy on Scalar exemplified the possibilities that these technologies give researchers. On Monday, Kathy and Sarah continued to work on a scrapbook for Faye. The scrapbook documented Faye’s time at Teaching for Change. It was a small testimony to Faye’s work as the founding coordinator of the DC Area Educators for Social Justice. We will miss Faye but we look forward to seeing her continue to touch lives as she continues her teaching career in New York. Sarah attended a Teaching for Change workshop for a cohort of BLISS (Building Literacy in the Social Studies) Fellows, teachers in DC Public Schools. Deborah and Faye introduced the group to Teaching for Change and then led them through the Resistance 101 lesson, where students assume the role of a contemporary or historical activist and interview the others in the room. It was great to see how these resources end up in the hands of thoughtful and capable educators. On Wednesday night, Sarah attended a panel discussion on citizen engagement in America’s history hosted by the National Archives and the U.S. Association of Former Members of Congress. The panel brought together a student and teacher from Marjory Stoneman Douglas with Congress members Tom Petri (R-Wisconsin), Ted Deutch (D-Florida), and Eleanor Holmes Norton (D-District of Columbia). The panel sought to understand the nature of activism and in particular, its influence on Congress. On Thursday, Sarah started working on Make Reconstruction History Visible, a student project of the Zinn Education Project (ZEP) that encourages students to identify and advocate for public recognition of Reconstruction history in their community and the significant accomplishments made by newly freed people and their white allies. She is building on the work of Deborah Miller, a volunteer at Teaching for Change, who began collecting information state-by-state on existing historical markers recognizing Reconstruction Era events and guidelines on how to apply for new historical markers. By building contacts with state historical societies, ZEP can connect with local teachers and expand the reach of the #TeachReconstruction campaign. On Friday, Sarah sat in on a meeting about Putting the Movement Back into Civil Rights Teaching, which is a resource guide about teaching the civil rights movement. Learn more about the resource guide. Monday, June 25th: Welcome Vershunda! Vershunda Coleman joined us at Teaching for Change and will be working on NEH Civil Rights Movement Institute. She is majoring in mathematics education at Jackson State University. She writes, “Though my major is mathematics education, Civil Rights history and local history has always been a passion of mine. I was born and raised in McComb, Mississippi. I love to call my hometown a “diamond in the rough.” I have the opportunity to say that I helped my peers, my community, and even some of the United States come to this conclusion. During my high school career, I joined an organization called the Young Peoples Project (YPP). YPP pushed for people to know the history and the significance of certain places in McComb that played significant roles in the Civil Rights Movement. We brought life to a significant event that took place in McComb, MS during this time. We did what any historian would have done. We documented it by creating a documentary. We knew that this documentary would live long after our time. We placed it into the National History Day competition, where we won first place at the regional and state level and got the opportunity to place in nationals. It was in those moments that I fell in love. The feedback that was received was phenomenal. From that moment on I think that I was destined to do things like this. I chose to attend Jackson State University because of Jackson’s historical background (me being right down the road from the Mississippi Department of Archives just topped everything off). College gave me the ideal classroom setting. I have had math teachers give me a history lesson with mathematics incorporated. Teachers like that have shown me that the sky is the limit in a classroom setting. As a future secondary educator, I plan to operate analogously. The Civil Rights Movement is so broad, and there is so much to learn and find out. Soon, I plan to get the Young Peoples Project back up and active again so other students can have the thrill and excitement that I had when my local history was presented to me. On Thursday, Kathy joined our associate director Allyson Criner Brown at the Washington Lawyer’s Committee to attend a press conference comprised of a coalition of groups, including Teaching for Change, and individuals concerned about education in the city. Specifically, the press conference was called to discuss the release of the Coalition of DC Education and Equity Advocates open letter to Mayor Bowser and City Council about the search for a new DCPS Chancellor and Deputy Mayor for Education. The coalition calls for a transparent selection process and for the district to address the many concerns that DC educators and parents have raised about issues like the achievement gap. Those giving statements at the press conference included, Scott Goldstein of EmpowerEd Executive Director, Markus Batchelor of the Ward 8 State Board of Education Representative, Allyson Criner Brown of Teaching for Change, Suzanne Wells of the Capitol Hill Public School Parent Organization, and Kent Wythcombe of the Washington Lawyers Committee, WTU, and NAACP. Read the letter and watch the press conference. In the afternoon, Kathy went to the Smithsonian Folklife Festival. This year, the festival focused on Catalonia and Armenia. While there Kathy learned more about coffee, woodworking, stone carving, and the music of Armenia. For lunch, she ate a lahmajun, a flat dough topped with minced meat. After lunch, she grabbed a refreshing mango gelato to escape the heat of the day and watched Alidé Sans perform music in Occitan a language spoken in northwest Catalonia. Kathy then ventured to learn about some of the parade traditions, like giant figurines. The two figures pictured represented were king and queen Àngels and Andreu. On Friday, Kathy and Vershunda attended a talk on southern immigration, entitled “A Report Back from the Border: What’s Needed & What’s Next for Immigrant Families.” Panelists had come to share what they had born witness to at the southern border and to call for alleviative actions and systemic change. Maria Cardona, founder of Latinovations and a CNN Political Commentator, reminded those gathered about the importance of facts and combating misinformation. Cardona implored the audience that “fact still do matter.” In particular, she emphasized that the fact that many migrants are going to the US as a “last possible solution, not just for a better life but for life.” Indeed, the theme of the day was about the importance of facts, of gathering knowledge, and making equitable systemic changes. Abel Núñez, Executive Director of CARECEN Latino Resource and Justice Center continued the theme of the importance of facts. He noted that as current immigration law is written it is a fact that the government can enforce immigration through the incarceration of family units and criminalizing child immigrants. Núñez said, “We must look at the legal framework that permits detention in the first place.” It is only through deeper systemic change that we will see lasting change. Maria Teresa Kumar President of Voto Latino spoke about the history of this crisis. She reminded the audience that this is “self-inflicted crises” and that the “[United States] exported the problem,” alluding to the fact MS13 began as a US gang whose members were deported and then continued gang activity in less stable countries. Ranit Mishori, MD, MHA, FAFFP, and Professor of Family Medicine and Director of Global Health Initiatives at Georgetown University School of Medicine discussed the health effects of forced separation. Mishori noted that forced separation can cause toxic stress that can damage a child’s brain and alter the DNA. Consequently, this DNA alteration can be transmitted to the next generation and produce generational trauma. She discussed the need for more health practitioners and researchers to be allowed into detention sites to monitor to the health of those detained and especially of children. Finally, Sindy Benavides, Chief Operating Officer and Acting CEO of the League of United Latin American Citizens closed the panel. She discussed that the detention of migrant families is a billion dollar industry, forcing the audience to confront not only children in despair but dollar figures attached to them. The talk was moving and we need action and system changes. After attending the talk on southern immigration, entitled “A Report Back from the Border: What’s Needed & What’s Next for Immigrant Families,” Kathy went through the lessons on Central America from the Teaching for Change project Teaching Central America. She spent time reviewing the lesson on El Salvador. This lesson and other lessons can help students and teachers begin to understand the complicated push-pull factors of Central American migration and how US foreign and domestic policy has contributed to instability in Central America. Learn more about El Salvador. Kathy spent a majority of the week working on reorganizing the upstairs resource center at Teaching for Change. She enjoyed organizing the books and learning about the wonderful resources at Teaching for Change. NPR played softly in the background while she worked. On Friday, she took a break from organizing the resource center and had some incredible Coconut Tofu Bites from Busboys and Poets. They were fantastic! Kathy spent most of her week at the Eaton hotel, slated to open in the summer of 2018. Teaching for Change helped select their library resources and guest room book titles. On Thursday, Kathy joined Nqobile at the National Museum of African American History and Culture for their educational seminar entitled “Let’s Talk! Teaching Race In The Classroom.” Kathy and Nqobile attended Enid Lee’s session on anti-racist and anti-bias education. Educators, administrators, non-profit workers, and staff from different museums gathered in the room to learn. Enid opened the forum with a question. She asked our group, “What is it that you would like to know more about?” From this simple question, she was able to “create the curriculum for conversation,” and encouraged us to do the same especially when having conversations about race. During the session, we learned how to include “all” stakeholders in conversations about education, discussions that involve students, faculty, staff, bus drivers, cafeteria workers, and custodians. It was a great learning experience, and all attendees were engaged, even asking for more time with Enid, which she graciously agreed to give. Enid also served as a Teaching for Change Fellow in 2016 and was an author and co-editor of the book Beyond Heroes and Holidays: A Practical Guide to K-12 Anti-Racist, Multicultural Education, and Staff Development. This Kathy’s last week at Teaching for Change. She had a full and dynamic summer. She reorganized the first-floor resource center with Sarah and updated the category system for the second-floor resource center. She attended a celebration of learning and got to see the work of 9-12th-grade students. Kathy learned about the DC public school system and the inequality that persists to this day. She learned more about immigration policy and history from attending talks and going through Teaching for Change’s lessons on Central America. She made tea cakes, attended cultural festivals, and made scrapbooks. Kathy also attended a fantastic anti-racist and anti-bias education training led by Enid Lee. She enjoyed working with children’s literature and writing book reviews, but she also appreciated the variation in her days and what she learned each day. Even in her last week, she learned much from a trip to the National Museum of the American Indian and from reviewing a disappointing book about the life of President Theodore Roosevelt. On Tuesday, Kathy went to the National Museum of the American Indian. The museum displayed the history of different Indigenous groups throughout the Americas, but with a particular emphasis on groups from what is now the United States, before the consequences of European occupation. The museum also touched on the continued struggles with the US government that Indigenous people and nations face to this day. Visiting the museum also revealed how public history is often an amalgamation of incomplete narratives. For instance, the museum showed how various governing officials and other public figures condoned the ill-treatment of indigenous groups, and some, such as Andrew Jackson, actively made policy that led to genocidal actions. Public history requires a reckoning with this uncomfortable and unjust past. We should call out resources that tell simplified portrayals of history, and strive for more educational opportunities that help us understand the complexity of history.